this is a blog called geometricsleep. : I like a Hannah McGibbon collection?!? I like a Hannah McGibbon collection?!? Wah wah wah. You guys, it's true. 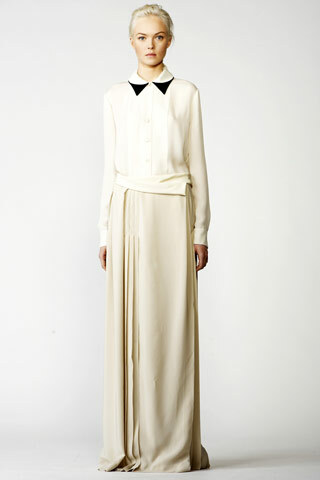 Chloe's presentation for pre-fall is totally amazing and I feel a little gross that I like it so much. I'm obviously not one to hold grudges and although I love and miss Paolo Melim Andersson, these clothes are definitely rad and I'd be remiss if I didn't post them. First of all, superblonde Siri is AMAZING ok? Girl is already a kind of magical fairy and that hair brings it to another level. This cropped jumpsuit is so perfect! I love the serious dark plaid and cropped pants and sleeves. The oversized jeweled detail on the neckline is the perfect hint of opulence and femininity for an otherwise borderline tomboy look. YES.YES.YES. If I was attending the Oscars or the Met gala or something, I would wear this. It's so simple and luxurious and for reminds me a bit of Mary Poppins (I love love love Mary Poppins, so this is definitely a good thing). YO WHAT? How perfect is this? I feel like this look wouldn't have been possible if it wasn't for Phoebe Philo's epic spring Celine show. A deconstructed camel skirt suit made to look like a long jacket split up in half. Even the description is magically delicious. I would not be opposed if this was the first nice suit in my closet. It really doesn't get any better than this. Impeccable wide plaid trousers with a matching button down shirt.My geometry teacher in high school dressed like this pretty much everyday and she was like, 5'2". I always loved it, it wasn't fashionable perse, but it was definitely a signature look that really suited her. Tomboy will still sure for fall of course, especially when it's this easy to pull it off. Maybe Chloe can live again! The shape of the jacket in the camel skirt suit is verrrry much like a couple of the Balenciaga pre-fall looks. Or vice versa I guess. Jus' sayin'. Ooooh yes, I love the Mary Poppins look! I am pretty obsessed with that structured jacket skirt combo the shade of camel/tan and the construction are both amazing. Ohh that last one looks really fantastic! I've never noticed this brand before! It really is an amazing collection. I just kind of stared and drooled for a long time. Those plaid trousers are perfect. Love the matching shirt. I would wear that first look in a second. Wouldn't change a thing. L O V E !!!!!! The "deconstructed" camel suit! I would wear it, often, til the end od time. It's just perfect.